RARE & FINELY CARVED ANTIQUE VICTORIAN TIGER OAK PASTRY TABLE We had some technical issues resulting in a few listings retaining only the one gallery photo. We're working hard to add the lost photos. For immediate service please send a message and we can furnish you with additional photos. Thank you, Adam for BCA. We take the utmost pleasure in offering you this fabulous late 19th century solid quartersawn oak Victorian pastry table. It is embellished with generous bead carved trimming and possesses a fabulously carved front and back facings with Hearts flowing over sprig carved decorations. It has a deep center drawer which is adorned with an original Gargoyle brass pull. The table is in impeccable condition measuring 40" long, 28" wide and 31 tall. We accept all major credit cards and are delighted to answer any questions that you may have or provide services you may need. Bay Colony Antiques carefully examines each and every item that we offer for sale. Any noteworthy flaw on any product that we offer that comes to our attention is disclosed. Please understand we deal in a very high volume of goods. Due to delicate nature of antique furniture & decorative art each piece is subject to reasonable wear and tear. We cant describe items to minutia. We simply dont sell goods that have major issues. We have expert woodworkers and re-finishers on staff to service any piece of furniture we offer. We represent all merchandise in absolute good faith and to the very best of our ability. Bay Colony Antiques delivers within a 175 mile range of zip code 01105 for a low cost flat rate. We specialize in servicing New York City. And we do it all free of any labor charges! This and our volume shippers discount creates a substantial lower cost for you. They are not furniture movers who bring the items into your home. We can get you special services in certain cases but you are responsible for telling us you require them and the extra cost of these services. If you instruct our shippers to provide services beyond curbside deliveries. We are responsible for any additional services and charged for these services. Again the process is all designed to protect your investment & an option offered for your protection. We dont like to send nice people off with things tied to roof racks. We are not a storage facility. We are happy to hold your items for a reasonable pre-agreed upon period. The item "ANTIQUE VICTORIAN SOLID TIGER OAK CARVED PASTRY TABLE GREAT CRISP CARVINGS" is in sale since Tuesday, June 9, 2015. 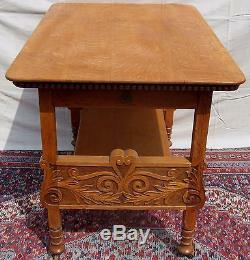 This item is in the category "Antiques\Furniture\Tables\1800-1899". The seller is "baycolonyantiques" and is located in Springfield, Massachusetts. This item can be shipped to United States.